Publisher: Hammond, Hammond & Co. Ltd. 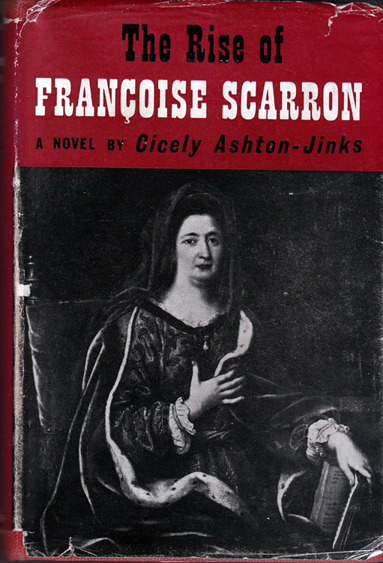 Description: Penned in her characteristic literary style, this is the fascinating story of one of history's strangest romances—the rise of a plain, unattractive woman of humble origin to the position of consort to Louis XIV of France. Her story is told with a wealth of detail and is set against a turbulent background of Court intrigue, whilst through it runs the gruesome story of Catherine Voisin, child-murderer and sorceress, with whom the Duchesse de Maintenon was suspected of being in league. Burgundy boards with gilded text on spine. Corners and spine bumped. Unclipped (9s. 6d. net) dust jacket is scuffed along upper and lower edges and has several nicks and closed tears thereon. Minor losses at head of spine; 2 cm vertical loss at tail. Closed-tear on rear lower-right corner. Extensive rubbing along front edge of spine (refer to image). Internally, the book is in excellent condition. Pages have the merest a hint of tanning and are very tightly bound. There is only the faintest suggestion of foxing on the rep. Neatly signed by the author on title page: v. sincerely yours, Cicely Ashton-Jinks. Measures 19 cm × 12.5 cm (7.6″ × 5″). Large 12mo. 304 pp.